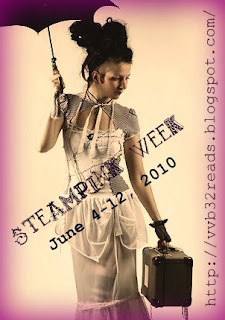 Ex Libris: SteamPink week at vvb32 reads! In case you have missed out of all the fun so far, it is not too late to join us at the amazing and very fun events Velvet has organized in her SteamPink week! Look out for corset wearing ladies holding their parasol with gloved hands, strolling through the train coaches, discussing technological and literary revolution and you'll find us. A week of steampunk themed posts about books, characters, recipes and many other interesting topics! Come and join the fun!